Can 'Unlocking the Cage' Be the Next 'Blackfish'? The announcement that Unlocking the Cage will premiere at Sundance is important because it reinforces the fact that there’s a vital role for nonhuman rights to play in the larger, critical conversation about how the law permits us to treat beings like Tommy. Nearly three years ago, a full-length documentary about the traumatic effects of captivity on an orca named Tilikum premiered at the 2013 Sundance Film Festival, the largest independent film festival in the United States. This prediction proved to be true, not only for Blackfish's initial audience at Sundance, but also for many of the nearly 21 million viewers who watched the film when it premiered on CNN in October of 2013 and the millions more who’ve watched it since on CNN, iTunes, and Netflix. The torturous reality of the ways in which captivity mentally and physically destroys orcas—which, in Tilikum’s case, directly resulted in the death of one of his SeaWorld trainers—was no longer as abstract as it might have been in the absence of Blackfish's powerful footage, expert commentary, and focused message. There, on viewers’ television and laptop screens, was the undeniable suffering of the orcas themselves, juxtaposed against the flimsy, self-serving logic that SeaWorld and other such exploitative businesses have promoted for decades to reassure the public that what it does to nonhuman animals is okay. Blackfish's message hit home. The impassioned, committed activism on behalf of captive orcas that the film has subsequently inspired continues to have a direct, measurable impact, now known as the “Blackfish Effect.” In the wake of Blackfish, SeaWorld has seen an 84% drop in earnings as of August 2015, for example, and projects a $10-million loss in profits this year alone. Radically fewer people are patronizing SeaWorld now that Blackfish is part of the conversation, which may be one reason SeaWorld announced in October of 2015 that it would end its theatrical orca show in San Diego. SeaWorld is apparently not yet ready to bring an end to captivity itself, as they should, but Blackfish-inspired advocates the world over refuse to relent in their just criticism of the underlying issues, principally the suffering that inevitably results from the denial of orcas’ freedom. In January, a documentary about the Nonhuman Rights Project will premiere at the 2016 Sundance Film Festival, three years after the premiere of Blackfish. Directed by Academy Award winner DA Pennebaker and Academy Award nominee Chris Hegedus of Pennebaker Hegedus Films, Unlocking the Cage follows the NhRP in the early stages of our long-term multi-state strategic litigation campaign to secure the legal personhood and fundamental rights of self-aware, autonomous nonhuman animals. While the film has not yet even premiered, it has already been picked up by HBO for distribution and will be broadcast around the world on HBO, BBC, and other networks later in 2016. We hope and anticipate that Unlocking the Cage will be the next Blackfish, and that it will add to the growing conversation about nonhuman animal rights both in the U.S. and around the world. One of the stars of Unlocking the Cage is a chimpanzee named Tommy, our first-ever nonhuman plaintiff. Viewers will be able to see Tommy exactly as NhRP President Steven M. Wise first did when he was investigating the living situations of potential NhRP plaintiffs three years ago: a 26-year-old chimpanzee peering out of his cage in a shed on a used trailer lot in Gloversville, NY, where, following the deaths of the other chimpanzees who used to be kept in captivity along with him, he lives alone with only a TV for company. Viewers will also be able to see other key moments in our ongoing litigation campaign, including the first habeas corpus hearings on behalf of our plaintiffs, discussions and debates about research and strategy, visits with legal experts and scientists, and much more. 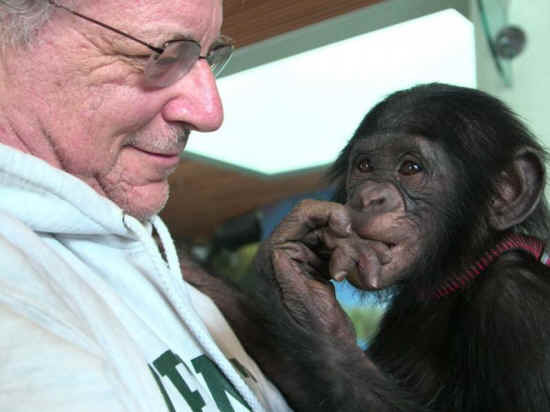 In the minds of many people, especially those who haven’t given much thought to the issue, the suffering of nonhuman animals who are imprisoned as our chimpanzee plaintiffs are—at someone’s home or business, or in the basement of a research lab—is more of an idea than a visceral reality, something animal welfare laws surely must be able to address, or so much part of the status quo that it’s difficult to see it for the inherent cruelty that it is or to imagine any way to change it. It’s much the same way with laws concerning the protection of nonhuman animals. Many of us know they’re out there, but we don’t really know what they do or what they can’t do (as those who’ve tried to vindicate a nonhuman animal’s interest in court know only too well). The announcement that Unlocking the Cage will premiere at Sundance is important because it reinforces the fact that there’s a vital role for nonhuman rights to play in the larger, critical conversation about how the law permits us to treat beings like Tommy. Potentially millions of people will be able to learn more, not only about our approach to vindicating nonhuman animals’ interests, but also what it looks like to go to court on behalf of a nonhuman animal in the 21st century and to finally begin to make a crack in the thick legal wall that has separated human beings from all other species for thousands of years. Above all else, we look forward to the possibility that the wide release of Unlocking the Cage will encourage even more people to consider the importance of nonhuman rights and inspire both new and longstanding animal advocates with the hope and knowledge that real, meaningful, systemic change is possible, with their help—and that it may indeed already be underway.